THE St Matthew's Choir and the Derwent Valley Concert Band will accompany the singing at the traditional Festival of Nine Lessons and Carols at St Matthew's Anglican Church, tonight (Sunday) at 7.30. This combined churches event has been celebrated at St Matthew's for about 30 years. It has its origins in Truro, Cornwall, in 1880, and has been adapted for use all over the world. Since 1918 it has been an annual fixture at King's College, Cambridge, and from there it has been broadcast to the world since 1928. 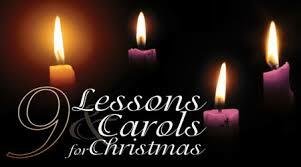 The Festival of Nine Lessons and Carols will be at St Matthew's Church in Bathurst St, New Norfolk, at 7.30 tonight. All welcome.